Agilent Technologies introduces two new low-noise power sources for applications in electronics and research. 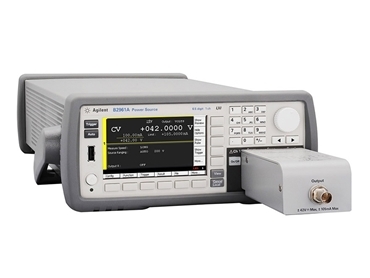 Part of the Agilent B2900A precision instrument family, the one-channel B2961A and the two-channel B2962A function as revolutionary power supplies for precision low-noise voltage/current sourcing. Power supplies and power sources primarily find use in electronic test and evaluation applications. The strong demand for lower power consumption and higher data rates requires more subtle and sensitive signals to be managed to fully characterise the devices or samples under test. Consequently, modern test equipment must meet stringent requirements for higher precision or lower noise, needing power supplies and sources to address increasingly difficult challenges. Agilent's new power sources incorporate precision, revolutionary performance and innovative sourcing capabilities beyond just a DC power source for every research and industry area.